You guys know I love particle simulations and projects. In fact, particle simulation stuff is what got me into motion graphics/visual effects in the first place, so I always appreciate a nice in-depth breakdown of awesome particle projects. Thanks to our partners over at Cineversity, we’re able to provide you guys with a nice, digestible, and organized playlists of content. In these presentations from NAB 2015, artists Casey Hupke, Athanassios Pozantzis, and Chris Schmidt share how they use Cinema 4D to create dynamic simulations and particle effects for film and motion graphics. NAB 2015 Rewind – Casey Hupke: Creating Complex Animations with X-Particles from Cineversity. In Creating Complex Animations with X-Particles, Casey Hupke demonstrates how to create a flexible, reusable X-Particles preset to control particle flow along a spline. 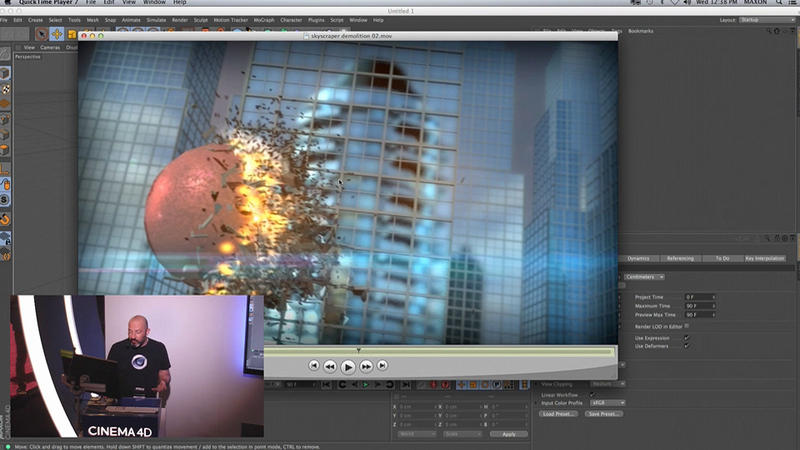 NAB 2015 Rewind – Athanassios Pozantzis: A Virtual Apocalypse with C4D, Part 01: Skyscraper vs Aster from Cineversity. NAB 2015 Rewind – Athanassios Pozantzis: A Virtual Apocalypse with C4D, Part 02: Planetary Explosion from Cineversity. Athanassios Pozantzis provides a tutorial on how to use Cinema 4D’s MoGraph and Thinking Particles features to create a visual effects shot of an asteroid destroying a skyscraper. He follows this up with a second presentation on simulating a planetary explosion. NAB 2015 Rewind – Chris Schmidt: Advanced Soft Body Dynamics Techniques from Cineversity. Chris Schmidt of GreyscaleGorilla demonstrates powerful techniques to artistically control soft body simulations using C4D’s particle forces, such as Wind and Attractor. He shows how he utilized these techniques to create dynamic text animations for the title sequence of Dumb and Dumber To.